CPVC Pipe | Plastic PVC Pipe Fittings - Bryan Hauger Consulting, Inc.
Mr. Vahidi (pictured center) after being presented the Lubrizol, Corzan® Industrial Systems Best Paper Award by Bryan Hauger, Technical Program Chair for the Plastic Pipes and Fittings Special Interest Group. Professor Hsaun, who co-authored the work is pictured at left. The organizing committee sincerely thanks all the speakers, co-authors and attendees who helped to make this Plastic Pipes & Fittings Special Interest Group (SIG) conference session truly successful. The presentations at ANTEC® 2017 were all outstanding. 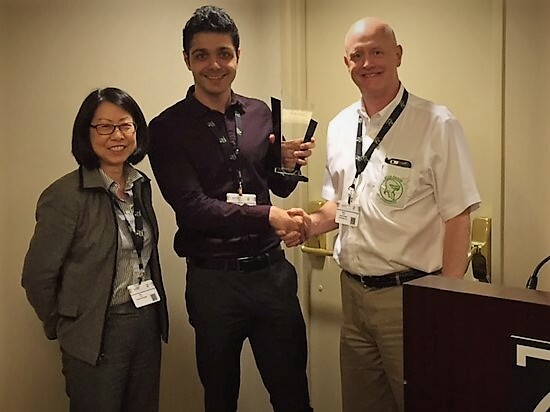 Lubrizol, Corzan® Industrial Systems Best Paper Award was presented to "A New Test Setup for Testing Polyethylene Tubes under Constant and Cyclic Internal Pressures". Contributing authors of the best paper were S. Vahidi, E. Schruba, Y. Sun, M. McCarthy, and Y. G. Hsuan with the presentation provided by Mr. Vahidi. Lubrizol Best Paper Award recognizes technical merit and innovation for technology advancements in thermoplastic piping systems connecting communities with vital infrastructure. For those who were not able to join us at ANTEC this year, there is still more good news. We hope to arrange for the publication of the award winning paper in Plastics Engineering magazine in the coming months. For those looking to play a greater role in the Plastics Pipe and Fittings SIG, please contact Bryan Hauger, Technical Program Chair, Plastics Pipe and Fittings SIG at bryan@bryanhaugerconsulting.com or call +1 720.378.7932. Here is the story for which we have all been waiting. A German heavy metal festival is highlighting the versatility and sustainability of plastic piping by building a beer pipeline to supply their festival. The Wacken Open Air festival typically sees about 75,000 attendees and a consumption of approximately 400,000 liters of beer over the course of the event. The pipeline provides several advantages to the festival. It saves on time, eliminating the need to open new kegs and allowing for continuous service. It also helps protect the environment. Previous years saw trucks drive on the grounds to bring more barrels, but the new pipeline will eliminate those trucks, helping to protect the ground. In another step to protect the ground, the pipeline is being built above ground. The festival also plans to build pipelines for drinking water and sewage. ​A recent study funded by the European Structural Integrity Society found some important differences between how High Density Polyethylene (HDPE) and Chlorinated Polyvinyl Chloride pipes (CPVC) deal with pressure and damage. HDPE, a polymer, and CPVC, originating from chlorinated PVC, were already known for a few key differences; most notably, CPVC handles hot water better than HDPE. In the study, the researchers developed a new approach to test burst pressure for pipe systems. They found a more linear pattern of damage acceleration with HDPE pipe and a non-linear pattern of damage acceleration with CPVC pipe. "WE&RF funds water research on behalf of its subscribers, and facilitates collaboration among organizations seeking funding partners for high-priority issues. WE&RF awards a contract through a competitive process and coordinates an independent technical review project through a staff-assigned project manager. All qualified entities – including international organizations and disadvantaged business enterprises – are encouraged to submit research proposals". This program "seeks to fund innovative research projects that will significantly advance knowledge and scientific understanding and that could provide fundamentally transformative results" relating to stormwater, wastewater, recycled water, and others". The total funding budget for 2017 is approximately $300,000 with typical awards ranging from $25,000 to $150,000. A minimum direct cost-share and/or in-kind support services of $25% is required. The due date for pre-proposals is July 12, 2017. A recent life cycle assessment finds that PVC pipe has strong environmental and economic sustainability for water systems. Pennsylvania firm Sustainable Solutions Corp. published this material in wake of recent news about the American Water Works Association suggesting that the country needs around $1 trillion in piping upgrades. The study suggests PVC remains durable because of its smooth interior, reducing the chance of corrosion or leaks while making costly repairs less necessary. Additionally, the study reaffirmed the safety of PVC piping, noting that pipes manufactured after 1977 had no vinyl chloride leaching reported, a problem that was documented in older pipes. Results of such a study could lead to further usage of PVC for future water main needs. Extrusion has been around since the Chinese have made pasta and the Europeans have made sausage. Extruders are very similar to today’s meat grinder/sausage stuffers. They basically consist of a motor at one end attached to a screw conveyor inside a metal housing, or barrel. Material is fed into the hopper, compressed by the forward motion of the screw, and forced through the die orifice into some particular shape. PVC pipe extrusion begins with the powder blending operation. The PVC resin arrives in a granular form, like sugar. It is added to a large intensive mixer, similar to a home blender. The intensive mixing action creates heat by friction of the resin particles rubbing against each other. As the resin heats the liquid ingredients are added to the formulation, which are absorbed into the porous resin particles. Next, the low-melting ingredients and waxes are added, followed by the higher-melting waxes and polymeric additives which get dispersed and adsorbed onto the surfaces of the PVC resin particles. Finally the solid additives are added and dispersed into the dry blend. The hot mixture is then transferred to a less intensive blender where the formulation is cooled and transferred to a silo or large holding container. Ultimately the PVC dryblend is transferred to the hopper of the extruder. The powder falls into the channels of the screw and is conveyed through the heated cylinder of the extruder. Most extruders use a single screw; however, PVC extruders generally use twin-screw extruders for better mixing and heat control. The screws compress the powder creating heat through friction and shearing, or mixing action, as well as forcing the powder against the heated metal chamber or barrel. Most of the heat used to melt the resin is derived from the mechanical shearing action of the screws and not from heat transfer from the barrel. In fact, during steady-state operation, many PVC extruders utilize screw- and barrel-cooling to control the temperature of the process. The screw fits tightly in the barrel, such that with each revolution of the screw, the top of the screw flight actually wipes away molten PVC from the barrel surface and collects the melt within the screw flight. By the time the PVC has been transferred about half-way through the extruder, the PVC mixture has become more of a cheesy, dough-like mixture. At this point, the screws are designed to decompress the resin and permit air and volatile materials to escape through a vacuum vent in the barrel. Next, the screws re-compress the PVC to complete the melting or fusion process, and pumps the viscous material into the die where the pipe begins to be formed. The viscous melt exits the ring-shaped orifice of the die in the general cylindrical form of a pipe. Because the melt has been under considerable pressure within the die, the material expands as it exits the die. The outside diameter of the extrudate gets larger than the orifice diameter, and the thickness of the wall becomes thicker than the die gap opening. In the short gap between the exit of the die and the cooling station, the extrudate is pulled by the downstream take-off unit to size the wall thickness, while the outside surface of the extrudate is sucked against the chilled vacuum-sizing rings which calibrate the pipe’s final outside diameter. As the pipe exits the cooling station, the pipe is cooled enough to retain its shape. The product is marked, cut into lengths, and stacked, ready for shipment.